Reading for the 2nd time. Most recently started April 10, 2019. This amazing, crazy, confusing, double world, fantasy, metaphoric recount and writing. Wow. This was stunning. It was so deep. It was brilliant and eye opening. It was hard to fully understand, and I will be reading it again. Ok. Now on to the review. I'm gonna try and do an organized review just to see if I can get my thoughts together. Black was really cool. The characters Thomas, Rachelle, Johan, Tanis, and then of course The Boy, and Teeleh. There was the introduction to everything Thomas knew, and everything he didn't know. The Earth that he stumbled into was amazing. The Black Forest was dark, painful, deathly, and creepy. I could feel the utter pain and terror that radiated from Thomas when he was in it and the evil that Teeleh impersonated. The way that the Roush and the Shatiki were both types of bats, but Roush being pure and white, and Shatiki being dark and evil and ugly. More than once the description of their eyes was simply "pupil-less. Like large red cherries"
And then the colored forest. Oh the beauty! The joy! They didn't know what it meant to be in pain, to be dis-satisfied or upset. The way they were so innocent, so clean and happy. The people. It was amazing. The way that Ted describes the world. It's amazing. And then the story itself. At first, it was hard to get into, hard to understand what was happening. Don't get me wrong. This kept me reading the entire time. But it was rather mind boggling, like all fantasy is. The way the story progressed was really well done. Red. What can I say? It was amazing. Where Black focused on the fall and the contrast of evil vs good, Red is the description of the fight against heresy, and the possibility of yourself being the heretic. The characters, again. Loved them. Rachelle really developed herself in this book where she seemed to be lacking in Black. Thomas grew stronger, wiser, and more manly. And yet he was so torn, and so tired, constantly going from one world to the other. In his "dream" world, the Forest Dwellers had retreated to the forests that Elyon had left for them. They must bathe every day to keep the disease of the Horde, and of the Scabs, at bay. This is symbolism of sin. I believe that the water represents The Word. Marie and Samuel seem like extra characters that had to be thrown in to show that Rachelle and Thomas actually did something well he didn't dream for 15 years. Which was only 8 hours on earth. In Red Kara Thomas's sister is also developed to have more strength than she had in Black. I love Mikil, and oh my goodness my heart. Martyn. Johan. Carlos and Johan. That's all the same person! It was an epic adventure, realizing that both worlds were connected. And Justin. What can I say about Justin? He's the sweetest, most sensitive, loving character, but he's got a courage and a confidence to stand for what is truth. Can't tell you I was surprised that He was Elyon. That line that Dekker kept using. "Am I a lion? Am I a lamb? Am I boy? Am I father or son? Am I Justin?" Because God, Elyon is so big, He is all those things. And that ending. Oh my goodness. It was amazing. It was refreshing, the love, and the raw emotion, giggling, sobbing, then laughing and then weeping. Everything so perfectly mixed to express what our hearts go through. And white ended it all perfectly. Chelsie. A new main character, Mikil now married, Suzan, and Johan. Dear Johan. The red lake. The requirement to drown to live. The way that was explained. Wow. And then of course there was the idea of how to gather more Scabs to Justin's bride, like He had told them to. The way Dekker handled that situation was perfect. And then there was the virus. The terror and the despair for an antivirus. It was beautifully played. Although I have to say that Thomas using his "dreams" so freely and easily to get help in the other worlds, it seemed too easy, but the problems themselves were so huge there wasn't really hard to accept it. And then of course the beauty of the discovery that Thomas's blood allowed others to travel to the other reality, and discovering who was linked to who. That made it so much fun! I think that Mike and Theresa were extra characters that didn't need to be there, but they played their parts well none the less. And the end was satisfactory. It left open smooth streams of clean questions, available for whoever is interested in reading Green and then the other books, but for myself, those questions were something to look into later in life. When I recover from such an awesome book. In conclusion. If you have 4 days in your life that you can do nothing but read and you can get your hands on this book. Do it. It's awesome. It changes the way you look at Elyons love and the Great Romance itself. You won't regret this book, I can tell you that much, unless you're not taken to fantasy very well. I wish I could keep talking, I feel like if I don't stop you can't not read it. You should. Really. 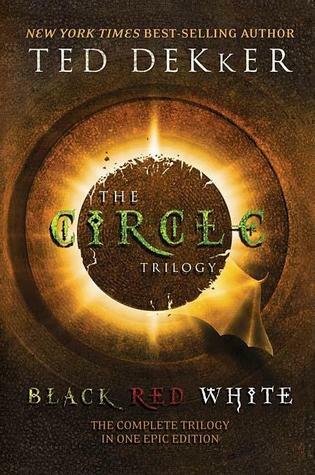 Sign into Goodreads to see if any of your friends have read The Circle Trilogy. 0.0% "Guys I am so so sooooo excited to be reading this! I can't even express my excitement! So a couple of my friends have been recommending this series to me for MONTHS. It's one of those really thick, big, and deep books that you can't just get from the library for a month. Well for my birthday they got me a copy! Hopefully I'll keep a constant update going since I won't be reading it all in one sitting." 2.62% "Oh man guys. Super weird and awesome, my friends sort of explained a bit of back story so I know what's going on and it's not as confusing to me as it might be to some people. What is the water? That's what I want to know." 6.43% "Oh no oh no oh no!" 17.09% "Wow Teeleh is clever, evil. Both together. Thomas, so easy. So easy to deceive. Never rely on your own reasoning. Remember what you know to be true. Even if you don't understand. Oh Thomas. It's because of you in the very beginning that Raison Sprain happened. It's your fault from the beginning Thomas." 17.09% "Partially this is terrible because Thomas acts like such a blond!!!! He's so clueless! Does he have any idea who Teeleh is??? He's literally Satan Himself! I'm honestly having a hard time enjoying this book because of how easy everything is for me to see. There's almost no work and no guessing." 17.17% "So why is it that normally time doesn't correspond to his "dreams" in the other world, but at this moment when Teeleh not only made him repeat the sentence he repeated it in the world He was sleeping in and in a timely manner?" 18.19% "End of Chapter 20. Or really the whole thing. Meeting Elyon. Now that is a talented author. Wow. That was sooo cool. 20.64% "Oh! Now it makes sense. That's why he spoke out loud through his dream." 23.52% ""Trust me. I'm supposed to rescue your daughter." I'm loving this book like a apple lollipop." 24.62% "Did that really just happen? I mean did it really?" 25.63% "Thomas just called Teeleh "this overgrown fruit fly." I love how it's so well portrayed. He's massive and beautiful, and he has green eyes because he used to be a wise one. How cool is that?" 26.06% "Yes. The Deceiver. Now he's shown in his true colors, and he deserved every bit of the dark ugly evil radiating from him." 35.19% "I'm finished with Black. Now onto Red." 40.78% "Book Red. Excited. Nervous. Thomas is so tired." 45.69% "I just started coughing. Trying to get this nasty creature out of my lungs. Eh. 56.51% "Ugh... since when do I care about all this politics? It doesn't have to be so complicated! Senator this, President that, Prime Minister so and so. Yeah whatever. They're a big blob of lots of people. Government. There you go! Just solved all your name problems "And the other man from the government said this:""
56.85% "Wow. That was totally not just weird and fascinating at the same time. Wow. Just wow Thomas. Well done." 63.62% "That was the most brutal, graphic, evil, torturous execution I've ever read or witnessed. It's a type of Christ, no? I believe it is. To see it again. It's amazingly horrid." This is like a love hate relationship. I can't stand how Ted took metaphors from the Bible and created metaphors out of them. From his book you can read into it in a way that God may never have intended. Anyway. Excited to start White. I wonder what happens next, but that's the whole point of books isn't it?" Nobody will ever understand my insane excitement for starting this book!! Guys try to understand. IM SO EXCITED!" One of my best friends name is Justin. Every time I hear them glorifying Him because He is the human form of Elyon, it makes me do a double take. XD. To me Justin is Justin. Not Elyon. XD"
70.05% "MIKIL IS KARA! MIKIL IS KARA!!!" 70.56% "I'm so confused right now. Wow. And excited. But mostly trying to grasp what is happening." 72.59% "This is crazy. I can't believe this. Monique. And now Thomas. Guys. Thomas came back to life FOR THE THIRD TIME! And it's not the creepy supernatural garbage. Wow." 78.6% ""These are the people Justin is courting." That is the most unique, most amazing image and display of Jesus and the sinners. Wow. I had to underline that." 85.45% "Michal!!! So glad to have you back. How's Justin doing? Any chance you will explain this INSANE LIFE IM GOING THROUGH! Sorry. Didn't mean to yell." 85.62% "Thank you Michal. That helped a lot. :)"
86.97% "Bedtime. More tomorrow. :)"
95.09% "Carlos. Johan. You are such a murdered. How many? 5 men dead by your hand in 2 minutes? If it were not for Ethan and Tanya, I would not be reading this book. I never read about murders. This book is crossing the line so much." 98.31% "😭😭 hugs for everyone. This is overwhelming. Hugs for everyone." This has been completed. Go ahead and immerse yourselves in this long awesome review. And then Book!